One of the greatest television shows of all time is coming back, streaming on CBS All Access. Executive producer Jordan Peele has joined forces with CBS All Access to bring back the classic sci-fi series loaded with famous guest stars. Some familiar faces include: Ike Barinholtz, John Cho, Taissa Farmiga, Ginnifer Goodwin, Greg Kinnear, Sanaa Lathan, Tracy Morgan, Kumail Nanjiani, Seth Rogen, Adam Scott, Rhea Seehorn, Allison Tolman, Jacob Tremblay, Jessica Williams and Steven Yeun. 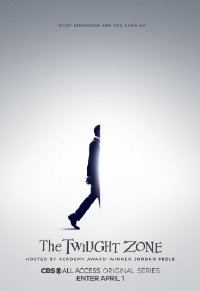 The Twilight Zone premieres Monday, April 1 on CBS All Access with two episodes. Check out my two chapters in "Twilight Zone and Philosophy," available on Amazon.com!